The Calgary Flames got potential greatness in net when they chose South Portland, Maine native Jon Gillies in the third round of the 2012 NHL Entry Draft after a couple of seasons with the USHL’s Indiana Ice (and a year at Salisbury School in Connecticut before that). 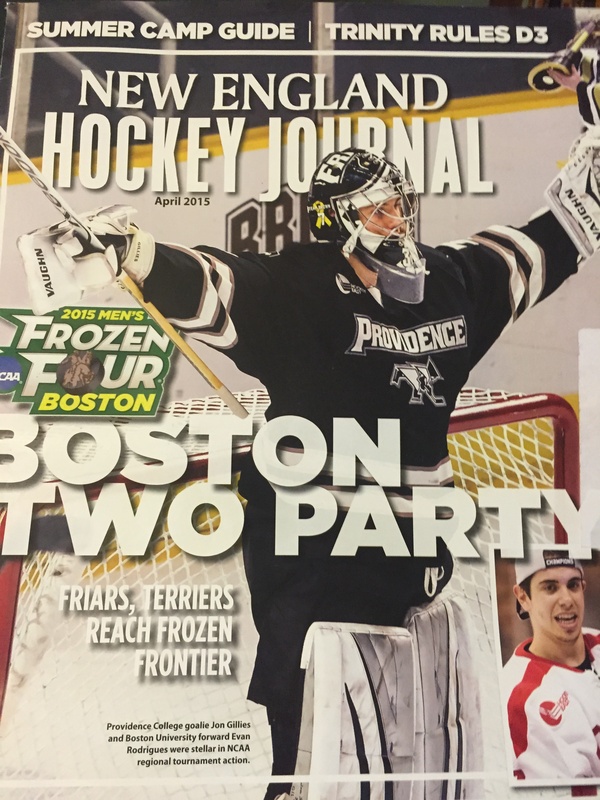 As impressive a physical specimen as you will find at 6-foot-5, he most recently backstopped the Providence College Friars to the 2015 NCAA championship in a memorable contest against Hockey East rival power Boston University, slamming the door in the final period after his club mounted a comeback. It’s not surprising, given that in each of his three NCAA seasons with the Friars, he stopped at least 93% of the shots he faced in at least 35 appearances every year, a tremendous testament to his focus and consistency at such a high level. The 21-year-old turned pro and signed with Calgary this past spring, where he is expected to play for the club’s new AHL affiliate in California, the Stockton Heat. He’s the modern pro goaltender with a huge frame and long limbs to take away the net from shooters. He has a winner’s mindset and is able to focus on making the critical save at crunch time, the hallmark of any championship puckstopper and player teams want to be a workhorse. Don’t be surprised if Gillies is skating into NHL creases before too long, but for now, he’ll take Calgary’s designed path for him a game at a time as he prepares to head West for his first pro training camp. Gillies took time out from some family events in Minnesota to talk about Providence’s run to the Frozen Four, his own journey and experiences on several championship teams and how he is looking ahead to his pro hockey career. 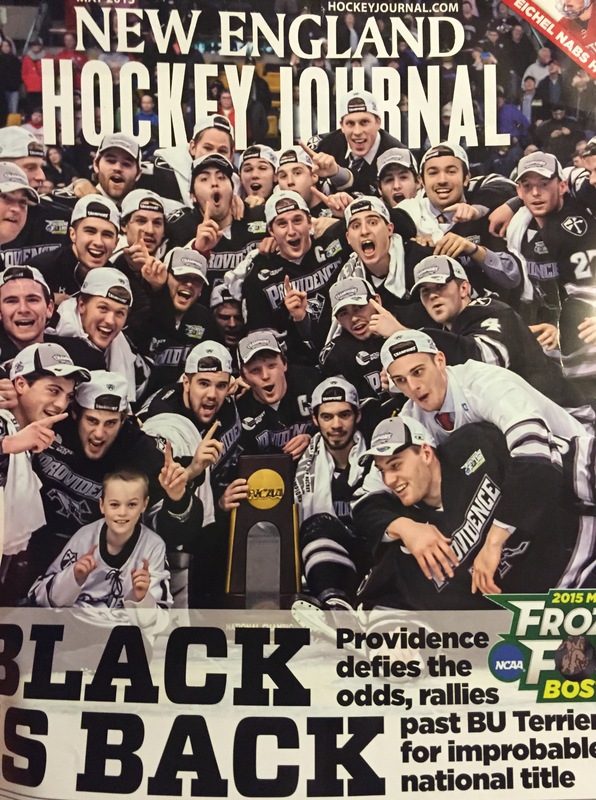 Kirk Luedeke: Jon- take us back to April to 2015 and talk about what it was like to be in net for your school’s first ever NCAA championship and the epic game of contest and wills that came down between two Hockey East powers like that? Jon Gillies: It’s hard to explain, really. I remember standing on the ice after we won and just kind of thinking of everything that happened over the past year dating to back when I decided to go back for my junior year and just thinking of all- the first thing that comes to mind is all of the sacrifices you’ve made with your teammates and just the work that gets put in there in the college season. There aren’t as many games as in pro, so there’s a lot more that goes on behind the scenes, a lot more work and practices and things like that where you really have to be tuned into at all times. It was pretty special this year with all those guys- my roommates and I were very close with everyone on that team and it was one of the most tight-knit groups I’ve ever been a part of. So, it was pretty special and sharing that experience with everyone was cool- my mom got a little emotional in the stands and I was so happy that she was able to be a part of it and to have both of my parents to be able to make it to pretty much every game living so close to PC, and several of my very best friends growing up were able to go to the game and see us win. The way it all came together to win the tournament is something I’ll never forget for sure. KL: Your dad (Bruce) has a history of playing hockey at a high level (goaltender at UNH, played pro hockey in several leagues including the AHL and IHL)- can you talk about your father and your parents in general in terms of inspiring in your own career and helping you along the way? JG: Yeah, my dad has been everything to me- at the rink, away from the rink…he’s been my best friend and a person I can bounce hockey questions off. We’re pretty much the same exact person when it comes to hobbies and interests away from the rink so, we can both get away from hockey in that aspect. I couldn’t have asked for a better person to have shared this ride with over the course of my whole career and to know what’s best for me, know what I need at certain times. I still think one of the biggest decisions he ever had to make as a hockey parent, especially when you played the position he did, it can be hard to step away from the technical aspects of something like that, but when I was 10 years old, he and my mother both agreed it was time for me to see a modern day goalie coach and get into that program from that age on. That’s something where you look back on it and it wasn’t that big of a deal at the time but for them to make that sacrifice was important. From then on, and before that obviously, he and I just always have been able to talk about hockey when it’s time to talk about hockey or not even discuss it all all. It’s been pretty special and I wouldn’t be anywhere without him. KL: Providence College- you got in on the ground floor with this championship group and you got to grow and mature for three years there. Can you talk about the transformation when Coach Nate Leaman came in and the team added pieces that ultimately led to your squad skating around with the championship trophy in 2015? JG: I think that back when I was 18 years old just graduating from high school and I chose Providence College the reaction I got from a lot of people was confusion. They were kind of surprised because obviously there were some more established programs at that time but the foundation that tells you a lot about Coach Leaman about a coach and person was just the straightforwardness and honesty he has. He was straightforward by saying it was going to be a process and a lot of hard work. But, if you come here you have a chance to be a building block and start something special and help the program transition back to its period of glory. The selling point for any goalie is- I think you try to go where you’re wanted and to have a chance to be a part of something that special and part of a program that was ready to take off with a coach like that and the culture he instilled was something that cemented the decision. KL: His old team Union College won it all in 2014…I’m sure that was something not lost on you, the players. Did you or some of the other veterans on PC get together this past spring and recognize the opportunity to win one for Coach Leaman as things were shaping up for you to make a run to the championship? Did you talk about how special it would be to see a team he had a big hand in win the NCAA one year and then the club he currently coaches win it the next? JG: I think after we lost to Union my sophomore year we felt for Coach Leaman a lot because we knew that although he would never make it about himself or anything like that, I think we knew as a group it was a very tough loss for him and it was a game he really, really, really wanted to win. At the same time I know the kind of person he is and he was so proud of Union College when they won the NCAA- he was so proud of all the players he had coached and was very happy for Coach (Rick) Bennett and the school overall. I think that says a lot about him as a person. When I think back to the beginning of last year, there were a lot of high expectations on us as a team externally- there were a lot of people picking us to win the Hockey East and we kind of stumbled out of the gate. But I think that was more happening because we didn’t believe we were as good as others thought we were- it took us a little while to get that in our mindset. One of the things Coach Leaman did to help us get there was to make sure we were focusing on each other and focusing on the things that we could control and applying that every day at the rink. And he made sure we were coming in with the goal to just get better each day. So it was kind of that one step at a time approach that he instilled in us from day one. So when you talk about trying to win it all because of what happened with Union College, I don’t think he would ever want us to have that mindset or anything like that. It might have crossed the minds of some guys, but I know that for me I wanted to win it for Coach Leaman because of everything he had done for me and the team and I wanted to win it for the group of guys I had the pleasure of sitting in the locker room and looking at every day and battling with in games every night, so those were the motivating factors for us, I think. KL: Having been a part of multiple championships- Team USA in 2013 and that world junior gold medal in your trophy case and now this- what in your mind do those championship teams have in common? What does it take to win at any level in terms of your hockey experiences- what are the uniting ties that bind on those winning teams you’ve been on? JG: The biggest thing I’ve noticed is the belief we have in each other and having the willingness to do what it takes to win. If you look at what we did in the (NCAA) tournament, we had guys diving headfirst in front of pucks…that shows a lot about the culture that was instilled here, but also about the camaraderie of the team and the willingness to play for each other and have each other’s backs; to be willing to sacrifice everything for the betterment of the team. The Team USA experience was a weird cohesion we had in terms of it being such a short tournament, but I think that’s where the (National Team Development Program) NTDP comes in where you have those guys that build the relationships over the course of two-plus years and then come together as a team like that so they’ve already hit the ground running. And then in terms of guys like myself and Johnny Gaudreau and Jimmy Vesey– all those guys that…we come in kind of cold compared to some of the relationships they’ve already built but they’re very accepting of us and welcoming and they just throw us into the mix. I have to say that the biggest thing for our Providence College team is that you don’t think about the past and things like that because there were a lot of things that we could have gotten discouraged about where we lost a tough series to UNH and we were on the bubble of the tournament. I think our biggest mindset was if he get the chance, we’re going to make the most of it. KL: You went out on top, signed with Calgary, they’ve probably made it clear that they have big plans for you- how has the summer been for you- the first in which you’re preparing for the new season knowing that you’ll attend your first main NHL camp? JG: I want to be open to knowing that adversity is going to come, and go with the flow and take everything in stride by learning as much as possible. I was in the mindset when I went out to Calgary at the end of the season and my mindset in the summer was… the biggest thing people talk about at this level is that you need to take a break, you need to a refresher, refreshment period…and thankfully, my family provides a good outlet for that. That’s what being home this summer- two months was pretty good for that. It’s fun going to the gym every day and working out next to two of your best friends and your little brother (Cameron Gillies), so that kind of stuff helps more than I think I realized at the time when I first started, but looking back on it, it’s been a great summer in that aspect. As far as training, you try to get to get better every day. You do the exercises once a week, and then the next week, you do the same but you try to get your weight up. The next week when you come across that same cluster or something like that and you just go from there. I was making sure that the fun I was having this summer was balanced out with hard work to get ready mentally and physically for the long haul of the season. KL: You went out to Calgary, you saw the city and was around members of the team and management/coaching staff- what are some of the takeaways you got from that brief period in Western Canada last spring, and what are most looking forward to? JG: I think the first thing you notice is the passion of the city and the passion of the fans. Everyone talks about it and you have an idea of it when you go, but I was sitting up top with some of the injured (NHL) guys for one of the home games and the catwalk was literally shaking from the crowd at the Saddledome and how incredible the energy from all the fans was. Every single person is in a red jersey and it was a pretty fascinating sight- so I’m very excited for that passion and how everyone cares so much about the Flames, cares about the players- the success on and off the ice of the individuals as well as the team as a whole. From what I notice about the team itself- the culture is a lot like- it’s very similar to the culture that Coach Leaman instilled in Providence- the never quit attitude and the expectation that you work as hard as you can and try to get better every single day, one game at a time- everything’s a process. It’s a great place to be and I’m very fortunate to be a part of this organization and the city and so I really can’t wait to get the ball. KL: Is there anything else you want to add or anyone else you want to recognize for your success as we wrap it up? JG: Just make sure that my mom knows that I love her and that she’s been as big a part of my success as my dad- we talked about him a lot but my mom doesn’t get the headlines, but as any hockey mom is- she’s been incredible and she’s a saint and I want to make sure that’s out there as well. Thanks again to Jon for taking the time to chat- although this blog tends to be Boston Bruins-centric, I want to have more of an NHL flavor from around the league and I believe that Gillies is one of the league’s young stars in waiting. Flames fans have much to be excited about in the years to come with their team, and I suspect he will be a part of that success.